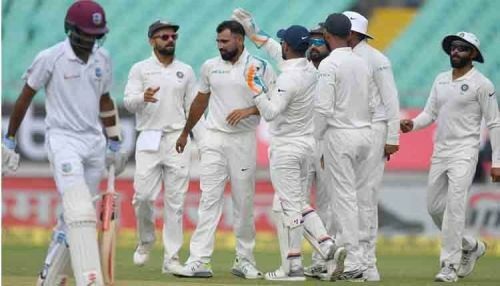 India hammered the visiting Windies team in the first Test played at the Saurashtra Cricket Association Stadium, Rajkot as the hosts completed their biggest win in terms of runs against Windies. The visitors were all out for 196 runs in their second inning after being asked to follow-on and conceded a defeat by an innings and 272 runs. Leading into their only remaining home Test series of the year, India was always the favorite to clinch the game. Astonishingly the Windies batsmen displayed no will to stay longer at the crease and there were only two fifties across their two innings on what was a really good pitch to bat on. Hero for India in batting was the debutant Prithvi Shaw, who scored a brilliant 134 while Captain Kohli scored his customary Test century and ended up with 139. Ravindra Jadeja later pitched in with his maiden hundred as well. The Indian bowling, especially the spinners dominated the Windies batsmen and cleaned them up below 200 runs in both their innings. Ravichandran Ashwin bagged four wickets in the first innings while Kuldeep Yadav collected his maiden five-wicket Test haul. India dominated the Test match thoroughly, still here are three game-changing moments from the first Test. Windies received the biggest blow of the match well before even the toss had taken place. 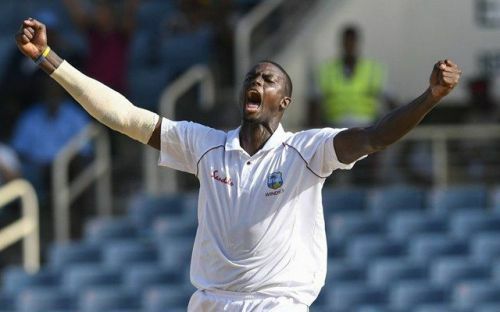 The captain and their primary bowler Jason Holder was ruled out of the first Test due to an injury which he attracted while practicing in the UAE. Windies opted for Kraigg Brathwaite as the replacement captain and handed a Test debut to Sherman Lewis. Windies, who were bowling first in the Test, severely missed the bowling of Jason Holder as the Indian batsmen kept piling on the runs. Holder has the experience of 34 Tests and has picked up 81 wickets in those matches. His inclusion could have boosted the bowling confidence of the team. Holder’s captaincy was also missed as Brathwaite was incredibly unaware of the required field changes. With no pressure at all, Indian batsmen made merry on the placid batting track and raised a mammoth first innings score. Holder was missed in the batting department as well. The all-rounder has scored two Test centuries and averages around 30 in Test cricket. A few runs from Holder could have decreased the losing margin.